Some of the coolest plants in the Fuqua Orchid Center aren't even orchids. 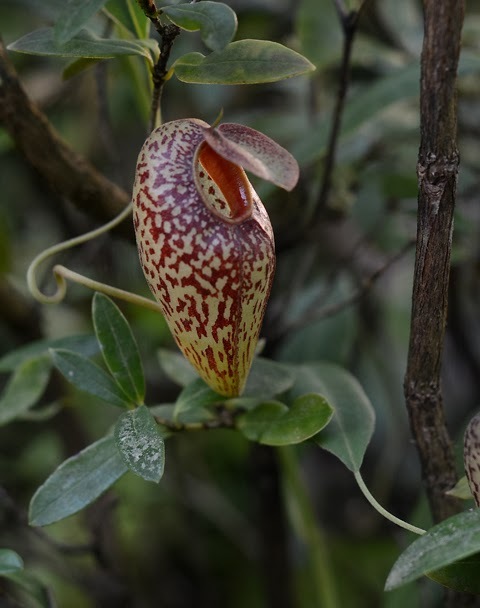 Meet Nepenthes aristolochiodes, a tropical carnivorous plant whose name alludes to the unrelated, but equally strange Dutchman's Pipe, Aristolochia. 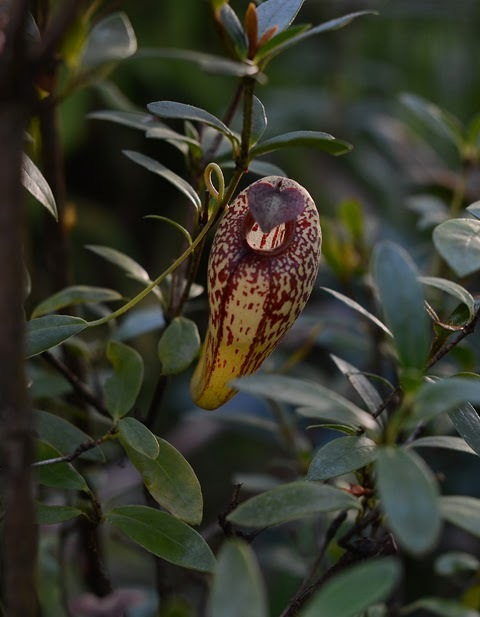 As you may know, carnivores are a specialty at ABG, and if you've been to the Fuqua Conservatory, you've almost certainly seen many fine Nepenthes on display. But Nepenthes aristolochiodes is something special. Notice how the mouth is located on the front of the pitcher, rather than on top, as in most Nepenthes. It is oriented vertically and faces the rear wall. The rear wall is a patchwork of red blotches and thin translucent patches, called fenestrations (from fenestrae, Latin for windows), that illuminate the interior when back lit, as you can see in the photo above. How does the trap work? Some insects, like flies, tend to fly toward a light source. They land on the rim to gather nectar. After their (last) meal they fly toward the illuminated interior, crash into the rear wall and fall into the liquid filled abyss below, where they drown and are digested. 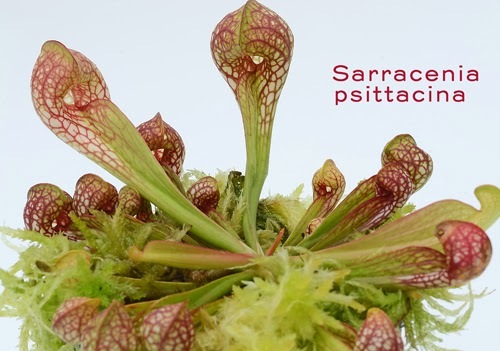 Nepenthes aristolochiodes shares this trapping mechanism with several unrelated North American carnivorous plants: Sarracenia psittacina, Sarracenia minor and Darlingtonia californica. It is sad to learn that this exquisite species balances on the razor's edge between survival and extinction. 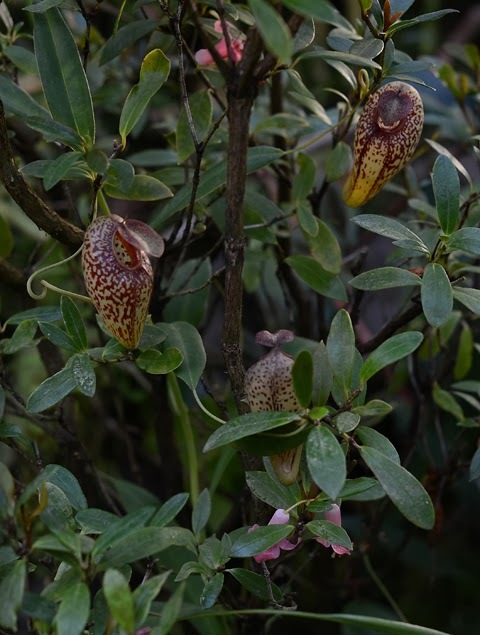 Stewart McPherson (in Pitcher Plants of the Old World, 2009) states that it is known from only three locations on the island of Sumatra, one of which, in 2007, had been reduced to a single individual as the result of poaching by Nepenthes collectors. According to McPherson, the two remaining populations, although more inaccessible, consist of just a few dozen individuals. You can see Nepenthes aristolochiodes in the Tropical High Elevation House of the Fuqua Orchid Center. Becky, thanks for sharing the information about such an interesting family of plants. Your carnivorous plant equivalents don't have a blog, do they?